This page shows the topic of each recent discussion and part of the most recent message in that discussion. To see discussions started by certain kinds of organizations, (for example, organizations involved in Human rights), click All sectors, then choose a sector from the menu. 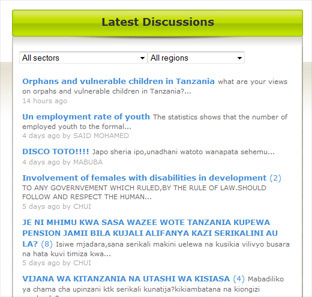 If you only want to see discussions started by organizations in a particular geographical region, click All regions, then choose a region from the menu. To read the messages in any discussion, or add your own message to any discussion, just click that topic from the list.